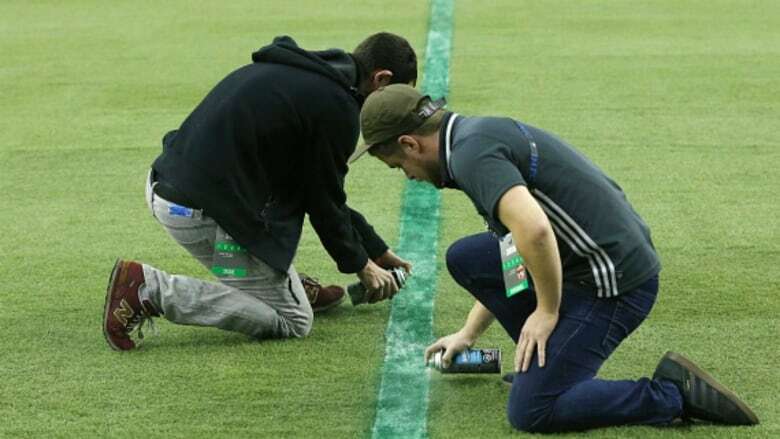 The BMO Field grounds crew had some fun at the expense of its Montreal counterparts Wednesday, sending out a tweet showing a measuring tape and a white line on a grass field. The good-natured jab was in response to the botched penalty line markings at Olympic Stadium which delayed the start of Game 1 of the MLS Eastern Conference final between the two Canadian rivals last week. After the players exited the field following their warmup, workers taped over the sidelines of the box and started measuring as a game official watched. It appeared the box was a metre or so short on each side. An Impact executive later apologized, blaming the blunder on human error. TFC defeated the Impact 5-2 on Wednesday night and 7-5 on aggregate to become the first Canadian team to advance to the MLS Cup final. Toronto will host the Seattle Sounders on Dec. 10.